4/1: “Hungarians in Homestead are looking forward with great expectations to the visit of Count Michael Karolyi, a member of the high aristocracy of Hungary, and leader of the Liberal party in the Magyar Parliament at Budapest….The purpose of his visit is to create deeper interest in the hearts of the emigrated Magyars in the political affairs of their mother country, and also, to organize Hungarian Americans in such a way that they would finally and morally help the National Liberal party in their struggle to free Hungary from Austria…” It seems he planned to visit Homestead for 20 minutes as part of a two week visit to the U.S.
4/9: “Ready for the Count,” read an article describing how the “Magyars of Homestead and the Pittsburg district generally” are preparing for the count’s arrival the next Sunday with a mass meeting in Pittsburgh and a street parade of Magyar societies. 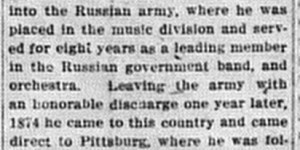 4/13: “Homestead took a principal part in the banquet held last night in the Monongahela house at which Count Michael Karolyi, leader of the United Opposition party of Hungary, was the guest of honor and among the several hundred Magyars of this district there were many from here.” The article went on to describe the parade and the mass meeting. One of the speakers at the banquet was Victor Kirzak of St. Elias Magyar Greek Catholic Church, Homestead and LOuis Regdon of Homeville, amongst many other small-town atttendees. “In the United States,” said the Count, “our people understand that they can be good citizens and at the same time increase the feeling for the land from which they came. I don’t think there is any other country where our citizens would be treated in such a liberal way. Our people feel really at home in the United States.” Interesting, given the accusations of dual-loyalty that anti-Zionists feared at this time and for decades after. 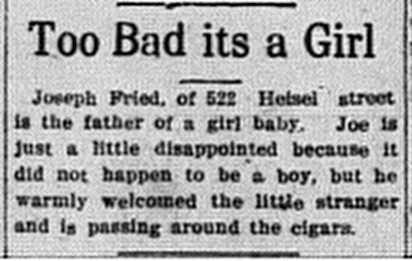 8/3: A editorial followed up on their “state of apathy.” The paper was not surprised. “When the once realize the superior advantages in this country they to a great extent lose, not altogether their patriotism, perhaps but enough of it.” Without any trace of irony the editorial concluded, “It is hardly worth while to be shot down merely for the political advantage of men, who, by the fortune of birth, have been raised to a position to control the destinies of the people.” And yet — they sacrificed their lives in analogous ways for the steel mill…. 8/5: The day after that, updates were received on some of the stranded Homesteaders. The two girls previously mentioned crossed from Paris to London, but no steamers were permitted to sail. No word was received from Joseph Fried or Emmanuel Schwartz. 8/6: Parcel post between France and Germany to the U.S. was suspended, and very little foreign mail was received in general. 8/8: Four members of the Hungarian Parliament, who came to the country with Count Karolyi, were to arrive in Homestead the next day around noon. They would attend church in Homestead, speak at a public demonstration in McKeesport, and then go to the Library Concert Hall where the Hungarians of the area would hear a speech in favor of Hungary freeing itself from the Austrians. 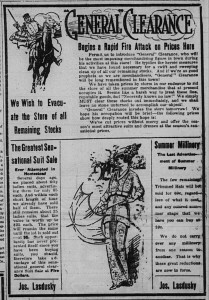 8/10: An editorial in the paper complained that foreigners were being recruited “for service in the war without provisions being made to take care of their families.” The editorial did not think this problem was occurring in Homestead, though. 8/24: “The Monongahela Trust company has received word through the state department in regard to Joseph Fried of Heisel street and Emmanuel Schwartz, of Fifth avenue who have been marooned in Germany since the beginning of hostilities. 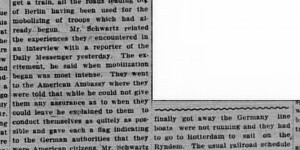 The cable states that they have been smuggled through from Berlin to Rotterdam and are expected to arrive in New York the latter part of the week.” Other Homesteaders were getting out of Europe, too, but not in nearly so thrilling a manner! 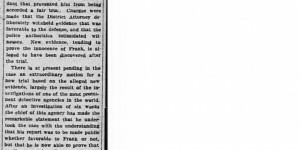 9/21: An editorial about the “general tendency among the readers of the war news to believe everything” insisted that “the information received as to the general conditions in the field are facts” despite the “too radical” censors. 9/29: “It is thought that the suicide of two foreigners here within a few hours of each other was partly and perhaps mainly attributable to their anxiety in regard to the conditions in the war zone n Europe where nearly all who live here have friends and relatives….Recently two of [the foreigners] were observed inspecting the map and both were weeping bitterly. They were quiet in their grief, but evidently there were matters connected with this war which they felt the effects of more deeply than we can realize and it is likely that some of the cases of self destruction here and elsewhere may be attributed to their anxiety over the present conditions of friends and the terrible consequences which are liable to follow.” It is possible one of these foreigns was Adolph Gutfeld. 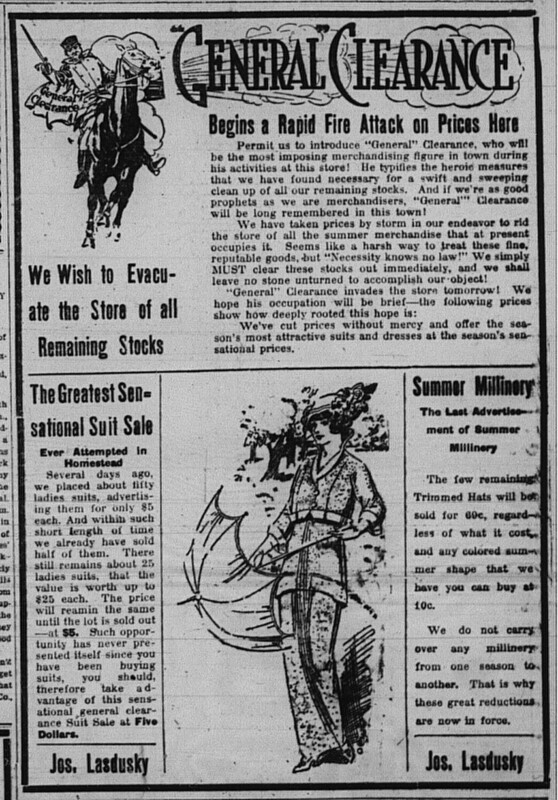 10/31: “Dead Soldiers Have Relatives in Homestead,” was the headline of an article about a recent list of the dead of wounded soldiers of the Germany Army. 2/13: The local boy scouts council included a Isadore Lasdusky on the Eagle Patrol and Herman Saron on the Owl Patrol for the Troop Council for Munhall Troop No. 1. On 3/3 Joseph Lasdusky was listed on the council of boy scouts. “Two more troops have been authorized – one each in first and third wards. Others will follow soon.” On 2/4 the paper reported there were three Slovak boy scout troops with membership of 51. 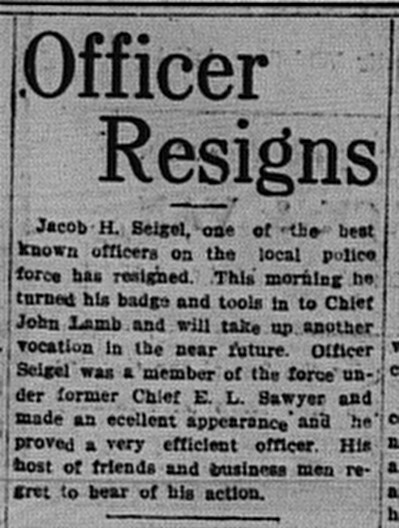 3/12: Jacob H. Seigel resigned from being a police officer. Full article here. 3/14: The Jewish community did not participate in all town-wide activities. 3/18: The town’s Chamber of Commerce nominated officers for the coming year. Lasdusky was up for vice president. 3/28: “A Chautauqua is assured here.” Amongst the people who helped assure there’d be1000 season tickets was Maurice Half. (This is an adult-education movement named after the town in which it originated.) 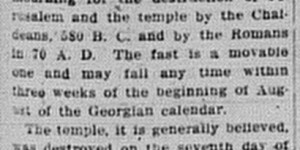 On 6/5 the paper reported it would take place 7/22-7/28. 6/3: The Business mens’ association planned an outing to Ashtabula Harbor on Lake Erie. Ben Little was on the committees for refreshments and the general committee. He was also in charge of train #3. 6/18: The business men returned home tired, but the winners were happy. They included H. Markowitz and D. Isrial (sic), who came in first and second in the business men’s race. 6/22: This summer’s early closing movement was gaining in popularity. Amongst those who signed on were H.L. Little, Samuel M. Harrison, Robert Savage, B. Little, Victor Shoe co., Half bros., Shuster & Workman. 1/20: The Eighth grade basketball team (with Siegle) defeated the Junior IIs (with Hepps) by a wide margin! Sorta embarrassing. 1/31: Now the sophomores beat the juniors, again with Hepps on the losing team. 2/9: Homestead Library Athletic League basketball games listed Hepps as a forward, Fogel guard, and Carpe from a midget team. 2/16: A roster for the Wee grade midgets included Saron. He was mentioned again on 3/23. 3/2: A library game included Hepps, Siegel, and Carpe. They were mentioned again on 3/5. 3/5: Another library team, the Tammany alley five, included Seigel and Hilk. 3/9: Another team had a player named Goldman. 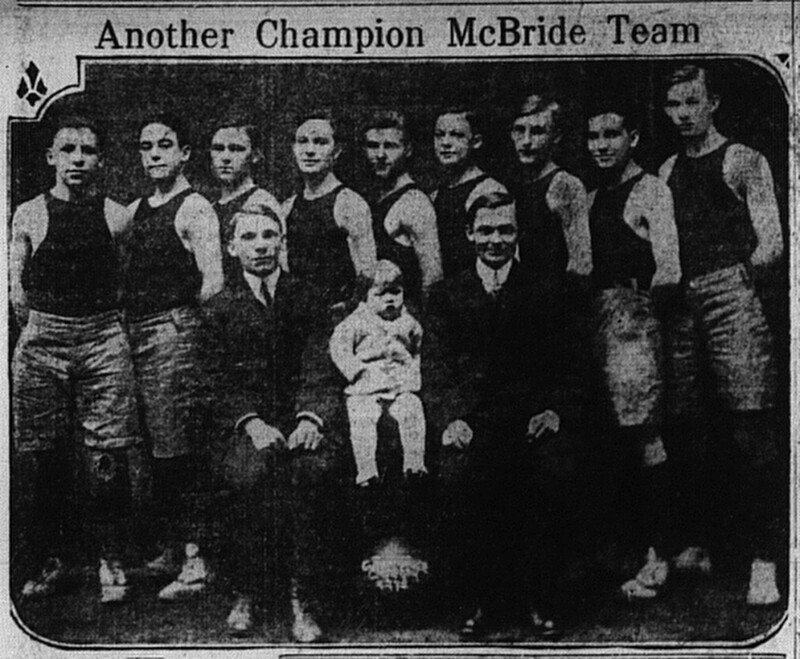 4/3: This is the championship McBride basketball team. One of these boys is L. Lasdusky. On 4/29 the paper printed the overall stats for the basketball players. He was #9 of the list of top field goal makers. 8/28: In a tennis tournament Morris Trau defeated Virginia McWhinnney, and Ben Trau was defeated in doubles. 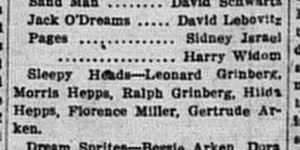 5/1: For the high school class of 1916 play, the prologue was read by Abe Schwartz. 5/13: Sophomore class winners in the debate against the juniors included Bernard J. Weis and Harry S. Winer. 5/19: List of high school graduates published. Amongst the academic graduates was Bejamin Lazerovitz. Amongst the recipients of certificates for efficiency in the commercial department were Samuel Israel and Lena Lebovitz. 5/26: The manual training school commencement included graduates Esther Grossman, Viola Schwartz, and Abraham Schwartz. 5/26: Elected as new “sub-teachers” by the Homestead school board were Olga Hepps and Emmeline Seigel. 5/27: Commencement was last night . 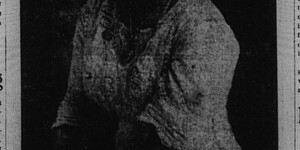 The class of 15 people included Fannie Kartub and Benjamine Lazerovitz. Certificates in shorthand/typewriting and bookkeeping went to 9 people including Samuel Israel and Lena Lebovitz. 7/14: The alumni group “got busy in earnest” in recent days. Their appointed class representatives included Arthur Grossman, 1911. 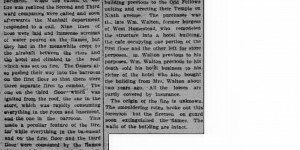 1/26: “The most disastrous fire which was occurred in Homestead for some years occurred at 3 o’clock this morning when the store of Joseph Lasdusky at 335 and the Walton hotel, at 333 East Eighth avenue were gutted…Mr. Lasdusky’s loss on his stock is approximately $15,000.” Full article below. 1/9: “Ben Little announces a bit shoe sale opening tomorrow and continuing for ten days…This year owing to the unseasonable weather Mr. Little finds himself with an unusually large stock on hand for this time of the year and he is offering greater bargains than ever before and all the lots are unbroken…” He, of course, bragged about his only two sales a year, too. 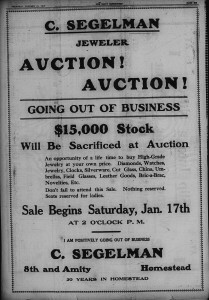 1/15: After 20 years running the jewelry store after her husband’s death, Clara Segelman was closing the store. 1/16: “Morris Half, of the firm of Half Brothers, dealers in furniture and house furnishings on Eighth avenue left last night for Grand Rapids, Mich. to inspect the stock of the big manufacturers of that city with a view of laying in a supply for the spring trade. His brother Lee, has been in Grand Rapids for a week past and together they expect to spend another week so as to get a thorough knowledge of the best grades before finally making their purchases. Mr. Half insisted before leaving that he had confidence that trade generally would be good during the year just starting.” 1/22: “Morris and Lee Half…returned this morning from Grand Rapid, Michigan, the greatest furniture market in the world and they state it was the most pleasant visit in the north they had had in many years…Half Brothers have made larger purchases than in previous years…” The article was very optimistic about business conditions, as before. 3/25: “Tomorrow will be the spring opening day for the stores of Homestead and al the business houses along Eighth avenue will take on a spring like look. Among the business firms which have made big preparations for the day is that of Half Bros., whose spring opening are events that are always looked to by the entire community. This year the firm has arranged for a bigger show than ever and besides the great exhibit which will occupy their entire building there will be flowers, music, and souvenirs. The opening will continue all day and as many as can do should come out in the morning and avoid the crowd in the afternoon and evening. Another opening that will be out of the usual tomorrow will be that of Joseph Lasdusky, who will throw open the door of this remodeled and refurnished store, which has been entirely restocked at 7 o’clock in the evening. Mr. Lasdusky has a surprise in store for all who visit his place of business tomorrow evening. No one should miss doing so…Friedlander will also have his opening tomorrow and besides a great display of millinery will [illegible] latest in women’s ready made goods. 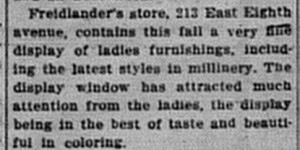 Read the ads in today’s paper for the particulars of these openings.” The ellipses omit the section on the Muldownery millinery store. So, three of the four exciting openings were from Jewish merchants! 3/26: In an article about the latest spring styles in millinery, the spring openings of B. Friedlander and Joseph Lasdusky were mentioned amongst others of the town’s milliners. 3/27: And entire articles (below) were devoted to the Half Brothers and Lasdusky openings. Lasdusky’s new store was compared to a Phoenix rising from the ashes. 4/23: “H.L. Little the popular shoe merchant, of 321 Eighth avenue who has for the past year conducted a branch store at 419 Fifth avenue, McKeesport intends discontinuing the store at McKeesport on account of B. and O. railroad company who owns the property contemplates building a depot. 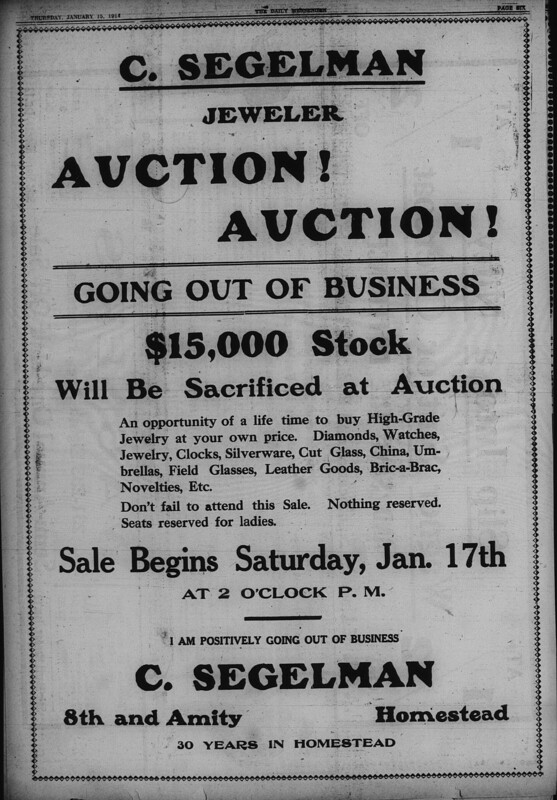 The entire stock will be brought to Homestead and placed on sale as sensation prices to be sold at once as Mr. Little’s shoe store is already crowded with shoes.” Didn’t he use this excuse for a sale last month, too? 9/19: Millinery openings! 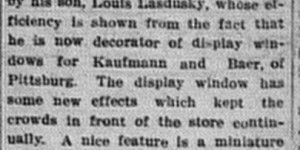 “Joseph Lasdusky‘s store, at 335 Eight avenue, is now fully decorated for the opening which will continue all next week…The decorations were the article work of Lewis Lasdusky…Friedlander‘s (sic) store, 213 East Eighth avenue, contains this fall a very fine display of ladies furnishing…The store has been completely renovated for the fall trade…” Full details below. 3/12: In a list of deeds transfers—Simon Halleron to Joseph Fried, 25×70 on Gold Alley for $1450. 6/18: Whoa. “While Mr. and Mrs. Max Klein and family were absent yesterday morning attending a wedding, their home on Greensprings avenue, Homeville, was partly destroyed by fire entailing a loss of about $1,500.” Their neighbors detected the fire and called the fire company. 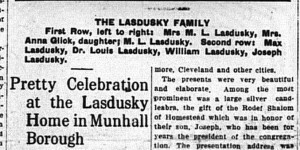 8/28: Joseph Lasdusky‘s father died. 9/14: “Meyer Goldman, aged 50 of 326 Third avenue, is in the Homestead hospital suffering from the effects of wood alcohol taken yesterday at his home. Dr. C. C. Huff was called and had him taken to the hospital where it is reported his condition is somewhat improved and that he has a chance of recovering. 6/15: The day after the anniversary a long article about the event with a photograph was published. See below! 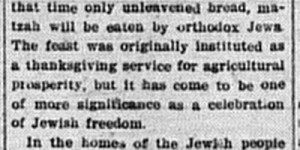 It seems like it was quite an elaborate event and involved the synagogue, the Hebrew Ladies’ Aid Society, and the I.O.B.B., in addition to the leading rabbis of Pittsburgh. A very big year — the second synagogue was dedicated! Those articles are posted elsewhere on the site, but linked to from below. 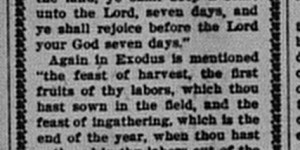 4/9: “Feast of Passover Tomorrow.” The usual explanation of history, rituals, &c. in the article below. 6/13: “The Homestead Hebrew Religious school under the auspices of the I.O.B.B. will render the following program at their closing exercises Sunday afternoon, June 14th at half past two in the auditorium of Carnegie Music hall.” Full program printed in the article below. 7/28: “Services will be held in the Orthodox Jewish synagogues next Sunday to commemorate the ninth day of Ab, known as Tishboy.” Full article below. 8/12: “The Young Women’s Hebrew association will give a dance this evening at Homestead Park. Dancing will be from 8:30 to 11:30 and the committee has prepared an excellent program. Markowitz orchestra will furnish the music and a large number from out of town are expected to attend. 8/26: “The last of the series of summer dances given by Homestead lodge 586 I.O.B.B. for the benefit of the Homestead Hebrew Religious school will be held this evening at Homestead park. Dancing 8:30 to 11:45. Committee assures all a good time. 9/4: Homestead Will Dedicate Its New Synagogue: This article, from The Pittsburgh Jewish Criterion, contains the complete program for the day. 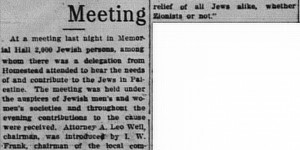 9/17: “At a meeting last night in Memorial Hall 2,000 Jewish person, among whom there was a delegation from Homestead attended to hear the needs of and contribute to the Jews in Palestine.” Full article below. 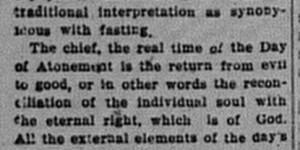 9/24: Soon following the annual ritual of explaining Yom Kippur. Article also below. 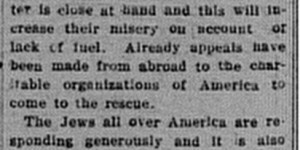 10/23: “A call has been sent out to the Jews of Homestead to attend a mass meeting to be held Sunday afternoon in the synagogue on Tenth avenue, to take some action towards helping to relieve the sufferings of the countless widows and orphans in the European war zone.” The full letter is below. “The Jews all over America are responding generously and it is also the duty of our Jewish community of Homestead to come forward with their aid in this great catastrophe,” wrote Dr. D. Reiter, R. Shermer, and H. Sapeer, in part. 11/16: “Over two hundred attended the lecture given yesterday afternoon in the Jewish Synagogue on Tenth avenue by Madam Bella Pevsner. Dr. M.H. Moss presided at the meeting and introduced Madam Pevsner. After the lecture a subscription for the relief of the Jews in Jerusalem was taken and a nice sum received. 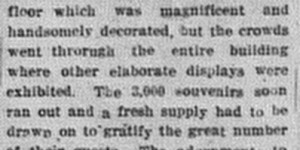 Part of her speech was reprinted in the paper (see below). 11/26: “Rodef Sholom Hebrew congregation will hold their feast of Thanksgiving this evening at 5 o’clock in the synagogue on Tenth avenue. Rev. Samuel Widom, rabbi will offer prayer and the children of the Sunday school will take part in the exercises. All members of the congregation are invited to attend. 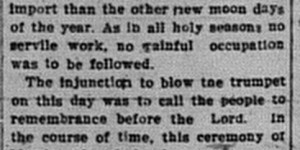 12/31: “The Young Men’s Hebrew Association which has been stirring up things in Homestead in the last few weeks has organized a basketball team. Thursday evening, New Years eve they will journey to Braddock where they will play the Braddock Y.M.H.A. in that organization’s hall on Talbot avenue. The members of the Homestead Y.M.H.A. will accompany the team to Braddock and if necessary will raise the roof to help Homestead win the game. The line up of the two teams follows.” For Homestead: Haupt, Hepps, Harrison, Markowitz, Margolis. For Braddock: Lasdusky, Young, Katz, Mervis, Israel. Marion Silovitch, a seventeen-year-old Jewess, who has worked in a little jewelry store in Brooklyn as a clerk for several months with no other ambition than to take her few dollars home to her mother every Saturday night, returned to her home the other day with a letter from the executor of her uncle’s estate in Odessa, Russia, an uncle from whom none of them family had heard in many years. “Your uncle has left you 200,000 rubles,” it read. That meant nearly $100,000. The uncle was a wealthy wheat commission merchant in Odessa. His poorer brother had emigrated to the United States many years before. He had not prospered, and he seldom heard from the merchant. But the uncle had always been partial to his niece. “What are you going to do with the money?” a reported asked the girl. “Make mother and father happy for the rest of their days,” was her answer. 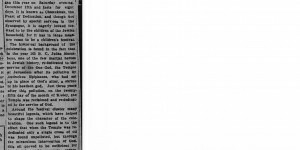 4/21: A long article review the status of the Leo Frank murder case. You can read it above. 9/17: “The Czar’s promise of political freedom for his Jewish subjects taken on a new significance now that Sir Edward Grey has publicly pledged the influence of England to promote the fulfillment of that promise…It remains to the everlasting discredit of Russia that the promise of Jewish emancipation made during the Russo-Japanese War was not only broken after the war, but was followed by wholesale banishment, bloody massacre and the revival of the ancient and preposterous charge of ritual murder.” More in the article below, including America’s point of view on the matter.